Published: July 16, 2015 at 11:14 a.m. Updated: June 23, 2016 at 07:49 p.m.
Lions fans are still waiting. The Super Bowl will celebrate its 50th anniversary next February, and you can safely assume the NFL will go all out to honor America's grand sporting spectacle. If history is any indication, the league's Detroit franchise won't be anywhere near San Francisco. Just four teams have never appeared in the Super Bowl. The Browns -- who should probably woo LeBron in free agency -- are one. The Jaguars and Texans -- the products of NFL expansion in the past two decades -- are two others. And then there are the Lions. That is one depressing club. Picture a weekly gathering at a dingy Elks Club basement where David Carr and Tim Couch compare turf burns that never healed, Blaine Gabbert practices trick shots on a worn-out pool table while Wayne Fontes sits alone at the corner of the bar, an unlit cigar tucked inside the right side of his mouth and a whisky in his hand. Matt Millen sits at the other side of the bar, but the two men never make eye contact. Old Motown records play on the jukebox, at least they do until the electricity cuts out. The Lions don't belong here. They're a proud franchise, one of the NFL's oldest teams. How could things have gone so wrong for so long? Then again, the Lions have never been blessed with riches. In the entire history of the franchise, which dates back to the 1930s, this team has never recorded back-to-back seasons of 10-plus wins. The modern era has been plain cruel. No playoff wins since 1991. No division titles since 1993. Two playoff appearances since 2000, both wild-card, one-and-done exits. And, of course, the 0-16 season of 2008 that served as the exclamation point (or sad ellipsis) of the Matt Millen era. Individual greatness of Barry Sanders and Calvin Johnson aside, the Lions are the NFL's version of a microwave burrito. Never great. Occasionally OK. Sometimes awful. Usually better when drunk. Decades in the freezer section of the NFL supermarket have landed this franchise at No. 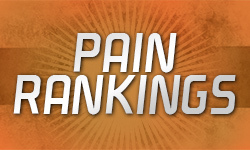 4 in the Pain Rankings. Note: While this exercise is primarily focused on the Super Bowl era (that being the period starting with the 1966 season), it should be noted that the Lions won NFL championships in 1935, '52, '53 and '57. Your grandfather might remember this. Or he might not. Listen man, it was a long time ago. Matt Millen was introduced as the president and CEO of the Lions in January 2001. Even at the time, the move was curious. Millen had enjoyed a successful career as a linebacker with three teams, but he had no front-office experience of any kind. Despite that, owner Bill Ford said he was willing to "stake (his) reputation on Matt's success." "If I had to go back and say, 'What would you change?' I would probably go back and follow John Madden's and Bill Parcells' advice to me, and that was make your own mistakes, don't make somebody else's," he said. "I acquiesced too often." Millen was responsible for drafting 62 players in Detroit. Only three would make a Pro Bowl. He was fired three games into the Lions' historic 0-16 season in 2008. Calvin Johnson is the only Millen-drafted player who remains on the team. The Lions went 31-84 under Millen, perhaps the worst stretch of ineptitude in NFL history. "I've been a season-ticket holder for 28 years and because they fired Matt Millen, I'm going to renew," one Lions fan told ESPN.com on the day Millen was fired. "This is the happiest day of my life." Millen became a villain in Detroit, and "Fire Millen" became a rallying call -- a friendly Motor City greeting, really -- and legitimate pop culture thing. In rival stadiums, schadenfreude-loving fans hoisted "Keep Millen" signage. When Millen was signed to an extension at the start of the 2005 seasons, fans organized a rally known as the "Millen Man March." Millen suffered in his own way. His Football Life episode painted the portrait of an overmatched guy who probably deserves more sympathy than scorn. Easy for us to say, of course. "I would be better served to lead the battle," Millen said of his front-office experience. "Give me the sword, let's fight. I'll guarantee the victory. But if I'm back there writing up the battle plan? And then I have to watch it? Give me the sword. Let's take the hill." In 2008, the Lions did something never seen before (or since) in the NFL: They went 0-16. Losing 16 straight games -- after a 4-0 preseason, no less! -- is hard to do. It takes a complete organizational meltdown. And while Millen rightly gets the most blame for what transpired, this ugly dog had many owners. Dan Orlovsky was just one of them. The former fifth-round pick was one of three Lions quarterbacks to start that season. Orlovsky was winless in his seven starts and made one mistake that cemented him as the lasting on-field image of that lost year. On Oct. 12, 2008, the 0-4 Lions traveled to Minnesota to face the Vikings. Backed up near his own goal line, Orlovsky took a shotgun snap and immediately started rolling to his left to evade the rush of Vikings star Jared Allen. During that escape, Orlovsky inadvertently blew past the back end line, resulting in the most embarrassing blooper involving the Vikings since Jim Marshall ran the wrong way. "When they started blowing the whistle, I was like, 'Did we false start, or were they offsides or something?'" Orlovsky said after the game. "And I looked, and I was just like, 'You're an idiot.'" The two points ended up being the margin of defeat (naturally) as Minnesota kicker Ryan Longwell booted a late field goal. We don't imagine this is how Orlovsky dreamed his first NFL start would go. Orlovsky's journeyman career came full circle last year when he re-signed with the Lions as Matthew Stafford's backup, a gig he still has today. 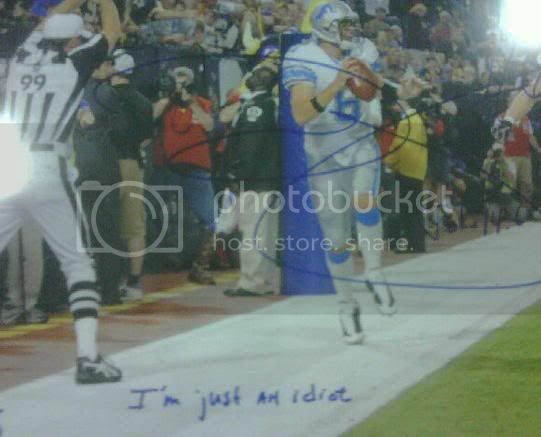 Orlovsky has a sense of humor when it comes to his infamous gaffe, too, as evidenced by the message scrawled under an autograph he signed on a photo of his play. Barry says goodbye: Barry Sanders was one season removed from a 2,000-yard campaign when he decided he was done with football at age 31. On the eve of training camp in 1999, he called the Lions to give them the news. There would be no elaborate retirement celebration. Sanders flew to London, his only public words came via a statement in the Wichita Eagle, his hometown paper in Kansas. He left the game just 1,457 yards shy of Walter Payton's NFL rushing record. "There's no doubt in any of our minds that Barry would have been the all-time leading rusher," teammate Herman Moore said on NFL Network's A Football Life. "When you look at when Emmitt Smith ended up getting that honor ... a lot of people looked at it like, 'Well, it's kind of an asterisk beside it. You got it because Barry no longer wanted to play, otherwise Barry would be the guy holding that crown." Thanksgiving stuffing: The Lions are a semi-respectable 35-38-2 in their traditional Thanksgiving game, including a 34-17 win over the Bears last season. But the nationally televised holiday games also helped to cement their punchline status during the lost years of the early millenium. From 2001 to 2012, the Lions went 1-10 in their building. The last loss, a 34-31 heartbreaker to the Texans, featured Jim Schwartz's infamous illegal challenge flag toss. Ah, memories. Flag gate: The Lions were nursing a three-point lead in the 2014 Wild Card playoff matchup against the Cowboys when Matthew Stafford targeted tight end Brandon Pettigrew on a third-and-1 in Dallas territory. The pass fell incomplete, but Cowboys linebacker Anthony Hitchens was flagged for pass interference on the play. And then ... he wasn't. The officials picked up the flag, Detroit punted (literally 10 yards, no joke) and the Cowboys scored the game-winning touchdown. Stafford, wired for sound, summed up the confusion well as he angrily prowled the sidelines. "How does that get overturned? How does that get overturned?" he asked. "Hey that's unbelievable. ... Congratulations. It's unbelievable!" Murray's miss: On New Year's Eve 1983, the Lions had the chance to do something few teams pulled off in the '80s: Knock off Joe Montana and the 49ers in the playoffs. With 11 seconds to play and San Francisco clinging to a 24-23 lead, Lions kicker Eddie Murray lined up for a 42-yard attempt. The kick sailed wide right and the Niners escaped. The Lions would wait eight long years before their next playoff game. "I lined myself up right, but I was trying ... I was trying more or less to finesse the ball through rather than just kick it like I normally do," Murray said afterwards. "It's like golf. When you hook the ball, and you leave it out and it doesn't come back in. It's the same principle." 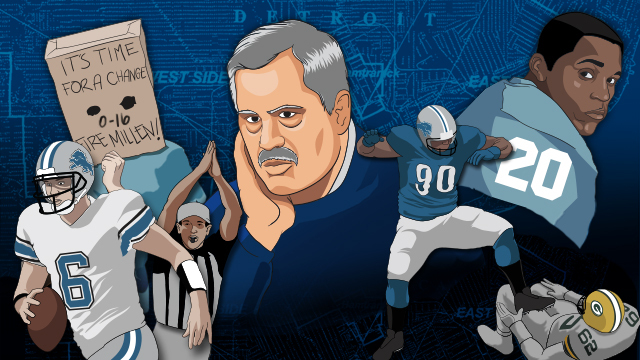 Take the wind: Marty Mornhinweg's doomed time as a head coach in Detroit is most remembered for an infamous decision made during a division matchup against the Bears in November 2002. The game went into overtime, where the Lions won the crucial coin toss. The team "took the wind" rather than taking possession, a bad decision that was outright insane when you remember this was before the modified overtime rules were put into effect. The Bears took possession, marched down the field and kicked a field goal to win the game. Mornhinweg was buried on a national level, but he stood by his decision when asked about it five years later. "The people who were there and know all the information ... know that it was the right call," he told Delaware Online. "It was the right call then, it's the right call now, and it's the right call 10 years from now." You're not going to believe it, but Marty has yet to get another head-coaching job. Since 2005, Dan Miller has served as the radio play-by-play announcer for the Lions. He's covered the Detroit sports scene for the city's Fox affiliate since 1997. In other words, Dan has seen some stuff in his day. In your first six years on the job as the play-by-play guy, the Lions went 23-74. Did all the losing make your job more difficult? Yeah, I think it makes the job more difficult. I think you still sit back and realize that you're lucky to be doing what you're doing. We all got into this because we love it. But having been around the team when they've won and been in the playoffs and being around the team when they're 0-16, believe me, for everybody involved -- from management to player to fan to broadcaster -- it's more fun when you win. How has the vibe of the city changed since the team escaped laughingstock status of the early aughts? It's an incredible football town, when you think about getting 110,000 people at Michigan Stadium on Saturday, in upwards of 85 to 90,000 people at East Lansing then 65,000 with the Lions, this city, this state loves football. And they just want something to believe in. And while they get angry when this team loses -- and there were times when they didn't come when this team was losing -- whenever they've given them something to believe in, be it the 2011 playoff run or last year, these fans are there and it's electric and it's crazy and this city loves this team. They just want something they can hold onto and enjoy. That scene in 2011 when they locked up a playoff berth -- a playoff berth -- against San Diego was incredible. And (former Lions coach) Jim Schwartz said something great after the game when he sent the players back out onto the field. He said, "There will come a time when we're not going to celebrate making the playoffs because that's something you should expect to do. But today isn't it." And I thought that was really understanding of the moment by him because it was a big deal, because they had been through so much. And to see how happy they were was really, really special. If the Lions ever made the Super Bowl and won, how would that compare to how the city has celebrated its other champions? We've been lucky enough to have Pistons parades and Red Wings parades and we have had the Tigers go to the World Series a couple times in the past 10 years and Michigan won a national championship in '97 and Michigan did win one in basketball, so we've seen a lot of great things that have happened here. But I've never met anybody that hasn't said if the Lions won it it wouldn't trump everything and it wouldn't be the party to end all parties. I can't imagine what it would be like to see that trophy go down Woodward, the parade route to Hart Plaza, it would be unbelievable. It's probably everything that's been pent up over the years by these fans and it's the one thing that separates Detroit from a lot of cities, it's the passion that runs so deep from grandfather to father to son. Do you ever think about what it'd be like to call the final seconds of a Super Bowl win for the Lions? Oh my God, yes. Absolutely. I mean, look, unfortunately probably one of the calls I hear most is my call at the end of 0-16. It would be a heck of a lot better to hear a call at the end of an NFC Championship Game that gets you to the Super Bowl or winning a Super Bowl to kind of replace that where you have a good memory versus a bad memory. Believe me, if you're in this business and you haven't been lucky enough to call one of those -- and I haven't -- you dream about that. Up next on The Pain Rankings: No. 3, actually, it's time to start guessing.